Baby’s nursery is small but sweet. In our little beach house, square footage is limited so we aim to keep the floor space as uncrowded as possible, but still cosy and comfy. Setting up Baby’s nursery took longer than I anticipated. 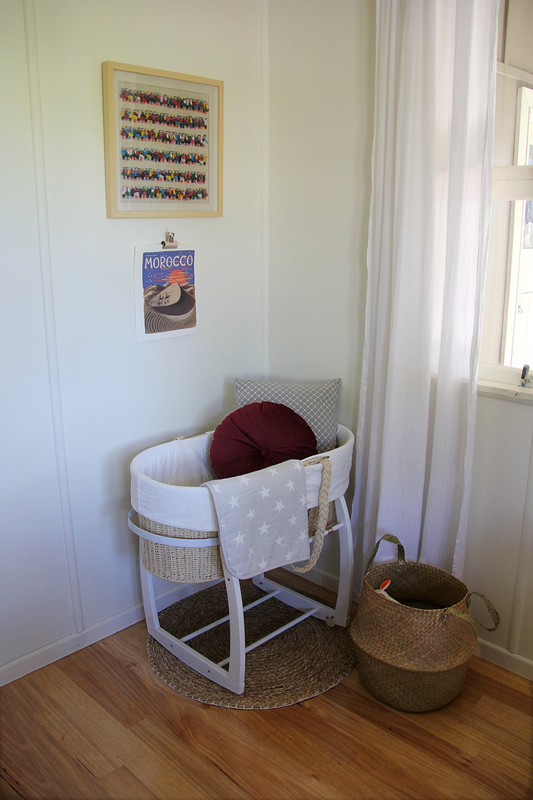 I really wanted to create a warm and inviting space that both Baby and I would enjoy spending time in. I also didn’t want it to be too babyish or gender-specific, but fun, playful and with a bit of colour. Once baby arrives, the bassinet will be moved into our bedroom. The bassinet is the Bebelicious natural organic Moses basket, which we bought second hand on Gumtree. The framed Peruvian wall hanging is from our trip to South America in 2015. The Morocco print is from Rifle Paper Co. which I hung with a metal clip. The chest of drawers/change table is from IKEA. We replaced the black handles with vintage brass ones we bought on Gumtree. Caleb made the hanging shelf from ply; I bought the leather straps on Etsy.